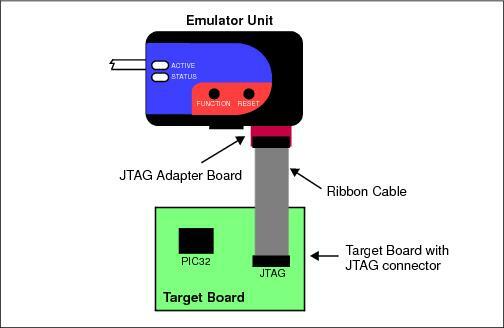 The JTAG Adapter (AC244007) for the MPLAB® REAL ICE™ In-Circuit Emulator may be used to provide JTAG communication between the MPLAB REAL ICE in-circuit emulator and a target PIC32 device. The kit contains a JTAG adapter board, a ribbon cable and an installation sheet (DS50002094). A possible JTAG connector for a target board could be the Samtec™ CONN, HDR, 2x7 Shrouded For Cable Strip, 130-inch RA Tail Length (TST-107-04-G-D-RA).